Hope Sewing is Genetic: Bon Voyage! And even though this is not exactly a great photo of me, it does show off two completed WIPs, at least a little! The girl smiling is NOT me... but that leg and the skirt ARE mine! Haha! My flowers are now finished,with only a touch-up appointment to go, and the skirt, made out of that lovely chair print, is one I finished! I managed to cross something off my mental to-do list - getting my machine cleaned! 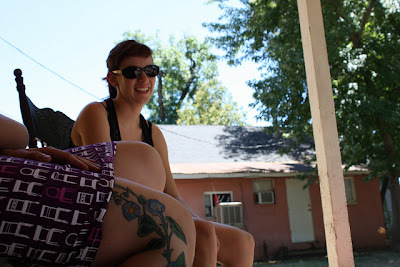 - at Cathy's Sew and Vac here in Chico. They recently moved, and even more recently became home to a local quilt shop, that had a yard of the chairs on sale for something like $4.50! How could I resist!! In fact, it was tough not to get the print in the dark purple, the light purple AND the red! I hope she has a really fun journey we talk quite often through email. Looks like you have a nice porch for hanging out and a good friend to sit with. keep sewing and keep your machine well oiled . It will keep it purring like a kitten. cheers, Claire W.